If you're on bed rest, you may feel as if you're missing out on the merriment of the holidays — especially if you already have little ones. Don't let the season slip away. Have a low-key holiday celebration without breaking doctor's orders. Every pregnant woman's bed rest limitations are specific to her condition. Some women may be confined to their beds while others may have permission to move around the house or even go out of the house for short periods of time. So check with your doctor regarding the details of your bed rest prescription before proceeding with even modest activities. You can spread cheer around your home with decorations but resist the urge to do any heavy lifting or climbing ladders to put up Christmas lights yourself. Ask your husband to lend a hand or invite relatives over for a "home decorating party" and allow them to help out with the more difficult decorating tasks. Set out some store-bought snacks and play festive holiday tunes to get your guests in the spirit of the season. One real benefit of being on bed rest? You have an iron-clad excuse not to fight the crazy Christmas shopping crowds. Instead, shop online from the comfort of your bed, then just sit back, relax and wait for your parcels to arrive. Many online retailers will even wrap and send your package with a card. Don't shy away from having guests over during the holidays due to your bed rest. But make sure any and all guests are aware of the condition before their arrival. Instead of planning a big spread and waiting on your guests hand and foot, let relatives and close friends help you out when they come calling this season. Since you'll have plenty of time on your hands as you rest in bed or on the couch, use it to your advantage to order up some personalized Christmas cards online and have them delivered to your home. If you're crafty, make your own DIY Christmas cards and invite your children to help out! 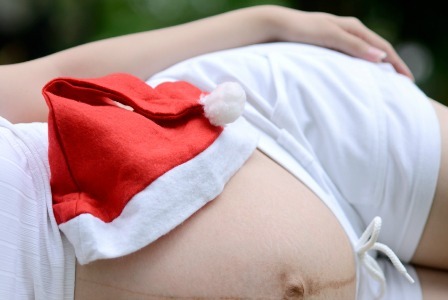 If this is not your first pregnancy and you have little ones who are thrilled for the upcoming holiday, find special ways to celebrate the season with them that don't involve breaking away from your bed rest. You may not be able to build a snowman or go ice skating with your tots this season, but you can enjoy quiet activities like threading popcorn on string for Christmas tree decor and creating other holiday crafts together, reading seasonal books, watching holiday movies and wrapping gifts. You may have to turn down most of the invitations to fun holiday gatherings this season but don't let that get you down! Take this opportunity to have special holiday celebrations with your immediate family. If this is your first baby, take advantage of the bed rest time to have some romantic at-home date nights with your man. Forgo standing in the kitchen for hours preparing a fancy meal and instead order take-out from your favorite restaurant, then snuggle up with a glass of wine (if your doctor approves it) or apple cider and read some baby books together. If you already have other children, plan a family game night.